For once a classic is done right with this continuation of the Micheal Myers horror Halloween. Watching this makes me really wish I had seen the original movie again as a refresher. If you don’t know already the Halloween (I guess we can call it a reboot) takes place after the original one. So you can forget the 2nd, 3rd, 4th and so on! 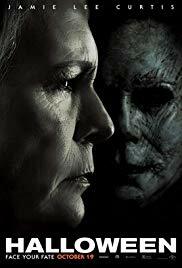 Four decades have passed since Michael’s first killing spree and since Laurie played by Jamie Lee Curtis (Halloween *1978, True Lies, Freaky Friday) barely scraped by with her life. In that time the survivor has trained not only herself but her daughter in the rules of survival. She’s trained and prepared for that one off-chance that Michael escapes and tries to finish what he started. But forty years is a long time! Long enough for people to forget and mark Laurie as the crazy lady who lives in a booby-trapped fort. Her own daughter Karen played by Judy Greer (Ant-Man and the Wasp, The 15:17 to Paris, Love and Other Drugs) has completely disowned her for making her childhood a living nightmare. Karen has her mind made up to raise her daughter Allyson; Andi Matichak (Evol, Miles) with as little interaction with her grandmother as possible. But Allyson feels bad for her grandmother and they end up forming a bond anyway. But when the bus that’s supposed to transport Michael to his new prison crashes and the monster escapes with a newly awakened desire to kill that bond is put to the ultimate test! You want to know the best thing about this movie? It wasn’t the jump scares, which there are plenty of good ones. and it wasn’t the fact that we can pretend every other Halloween sequel never happened, though that is a plus. It’s the original creepy music created by John Carpenter. That 70’s high pitch sound effect whenever Michael raises the knife or someone runs suddenly into a bloodied corpse. It allowed the movie to be new whilst keeping feel of the original movie. It was great! Before the final showdown, a lot of the kills are Allyson’s high school friends and other randoms. As always the scariest part is Michael just standing there with that freakin’ mask and they made good work of it. I was impressed by the long shots where Michael is watching his victim through the window before moving to the back of the house while unbeknownst to the victim they turn around and Michael is walking through their living room toward them! There were at least two scenes like this with no cuts just one long shot and clever camera movement and they were both fantastic. Rotten Tomatoes has this classic reboot at a 79% fresh! You’re going to have a great Halloween night with this one! There was a lot of watching this movie through fingers and closing my eyes altogether. I regret nothing. As said before you can forget all the other sequels. It’s the original and this one right here. Cult classics for the ages. It was great. A movie that deserves to be seen…but watch the original first.